Feedback refers to the modification of a process by changes resulting from the process itself. Positive feedbacks accelerate the process, while negative feedbacks slow it down. Part of the uncertainty around future climates relates to important feedbacks between different parts of the climate system: air temperatures, ice and snow albedo (reflection of the sun’s rays), and clouds. An important positive feedback is the ice and snow albedo feedback. Sea ice and snow have high albedo. This means that they reflect most of the solar radiation. With warmer polar temperatures, the area of sea ice and snow cover decreases, exposing new expanses of ocean and land surfaces that absorb an increased amount of solar radiation. This increase of total absorbed solar radiation contributes to continued and accelerated warming. Many IPCC climate models suggest a major loss in sea ice cover by the mid 21st century caused by albedo feedback from shrinking snow cover and increased open water areas in summer. A second feedback is negative: the cloud-radiative feedback. Its future impact is important but uncertain. Increased cloud cover, an expected result of global warming, increases the reflection of solar radiation away from the Earth’s surface, but it also increases the net long-wave radiation emitted downward from the same clouds back to the surface. 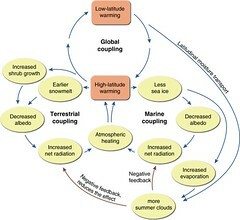 The net effect of increased cloudiness is expected to be a small decrease in radiation received by the Earth’s surface. 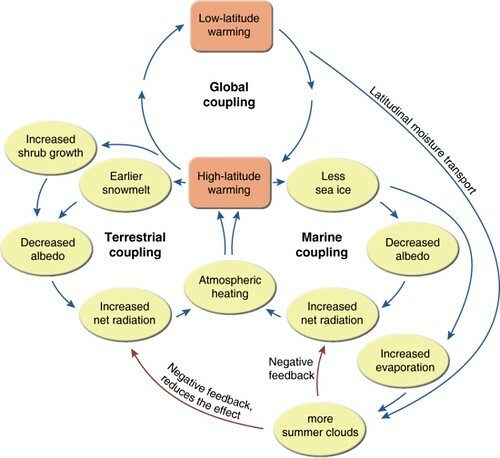 One of the great challenges of climate change science is to understand the net effect of these rather complex interactions. This is not just a question of understanding the physics of climate systems – many of these interactions and feedbacks also involve the living world. For example, the increase in shrub growth in tundra regions due to high-latitude warming leads to a decrease in albedo in summer, but an increase in snow retention in winter over large areas of land. Another feedback comes from melting permafrost that releases methane, a powerful greenhouse gas, into the atmosphere, which then amplifies the greenhouse effect.